I know a great many Protestants insist that all Catholics worship Mary. Unfortunately some do, but that is not part of the Catholic teaching. You are going astray if you worship Mary. Devout Catholics have a very intimate relationship with Mary. And that can be mistaken as worship. Why does Mary more likely appear to a Catholic than a Protestant. To be truthful Protestant are very nervous of having a relationship with Mary. They are basically been taught that is worship. And that is like a closed door, they will not let Mary enter in their lives. Some may be attracted to her from afar, but they won’t get close to her and so miss out on all that she has as the Mother of Our Lord has to offer them. You might ask what Mary has got to offer you. You will be surprised, the more you honour her the closer she brings you to her Son. Some prayers believe it or not won’t get answered without Mary’s help. She speeds the answer to your prayers quicker than you can realise. Not only is she the Mother of Jesus Christ, she was the greatest Martyr other than Jesus Himself, who is our Saviour. The thing is we are called to be semi-saviours. Jesus has paid the whole price of our redemption, but not everybody has accepted it. So God calls us all to make sacrifices for souls who are lost to Him. This happens only if we unite our suffering with Jesus. It stands to reason we can suffer all we like and not be able to save ourselves never alone somebody else. If you offer yourself up as a victim for God, God quickly accepts it, I know because I did a couple of times and He never says no to that one. Because He is starving for His lost children. He wants them so badly. To help out is costly, but that too brings you much closer to Our Saviour. The more we help out, the greater our faith and love grows for God. So what I am saying, nobody is Marys equal; she has suffered more; love more and has the strongest faith in Jesus than anybody else. Jesus has given her to us so that we can call her our Mother. It is His gift to us. She is more your mother than your earthly mother. Like Jesus would tell you she suffered more, to give birth to you than your earthly mother did. She has paid a higher price over you. And she loves you far more than your earthly mother does. Mary’s power to help, is God given. She has no power of her own, but because she was faithful in life she now rules in heaven as the Queen of Heaven and Earth. There is a lot of arguments about that. While people argue; Catholics are receiving visions of Mary as Mother and as the Queen of Heaven and Earth, all throughout Christian History. Miracles are happening by turning to her in prayer asking her to intercede on our behalf. I had a problem accepting Mary as my mother well after becoming a Catholic. I have a favourite book called ‘He and i’ and every time I turn to that book to read, it keep falling on pages that Jesus would say repeatedly ask My Mother. Over and over again, until I got fed up and so I said “All right!” I have been praying this certain prayer for years and years when I asked Mary I got a ‘yes’ straight away. She spoke to me and she was closer to me than I was to myself. So close that it scared me and she spoke so loudly and her voice was crystal clear and very beautiful. Many and many people will give testimony to Mary’s response to prayer. Luke 1:48. For he has been mindful of the humble state of his servant, from now on all generations will call me blessed. 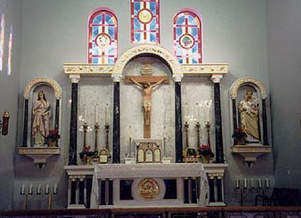 All the old churches that claim to be started by a disciple do bless Mary and honour her, it is just the Protestant that think it is a form of worship. My favourite prayer book has a prayer that I am just started saying. 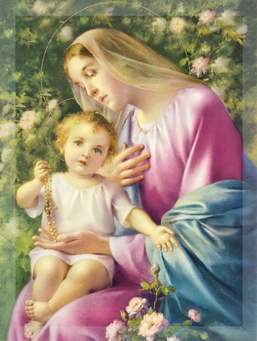 It is a prayer of consecration to Jesus Christ, The incarnate wisdom, through the Blessed Virgin Mary. I have had this book for about forty years. I kept away from this prayer, because you are offering yourself to Jesus and Mary as their slave. I didn’t have any problems calling myself a servant but I had great problems humbling myself an acknowledging that I am a slave first. God raises the humble. If you want to be great in Heaven than you have to consider yourself the least. So I am just starting to be comfortable with the word slave. Since I have been saying it I am getting even closer to Mary. I feel she is helping me even more. One paragraph I really like goes like this; O admirable Mother, present me to thy dear Son as His eternal slave, so that as He has redeemed me by thee, by thee He may receive me! O Mother of mercy, grant me the grace to obtain the true Wisdom of God; and for that end receive among those whom thou lovest and teachest, or whom thou leadest, nourishes and protectest as thy children and thy slaves. When we say things like grant us grace or wisdom or whatever we are saying pray for us so that we may receive these things. We are not saying she has the ability by herself to provide for us. We believe she has great influence on her Son. Jesus finds her irresistible, He can’t resist her request. Jesus has said this to many visionaries.